Provided by Colgate Athletic Department Sophomore Justin Lane turned in the best finish of his college career this past weekend, tying for second place with a minus-one score. This past weekend, the Binghamton golf team traveled to Colgate for the Alex Lagowitz Memorial Invitational. The Bearcats vastly improved on their opening performance on Labor Day Weekend, finishing fifth out of 17 teams. Leading the charge for the Bearcats, once again, was sophomore Justin Lane, who shot 68-75-72 over three rounds for a total of 215, leaving him at one under par (-1) and earning him a second place finish. Sophomore Jack Casler of Cornell tied with Lane at the end of the two-day event. This finish gave Lane his third top-10 finish of his collegiate career. In both tournaments so far this season, he has finished in the top-20 overall. His second-place finish is also the highest finish by a Bearcat since 2016, and his opening round score of 68 is the best score a Bearcat has shot in a round since 2015. The next-highest finish for the Bearcats over the weekend was sophomore D.J. Griffiths, playing in his first tournament as a Bearcat. Griffiths shot a 77-72-73 over three rounds for a total of 222, landing him in 26th place overall. Griffiths started out slow after a rough first round, but was able to come back after a stellar final two rounds. Tying for 34th place overall was senior Zak Ottman, who shot a 76-73-75 for a three-round total of 224. 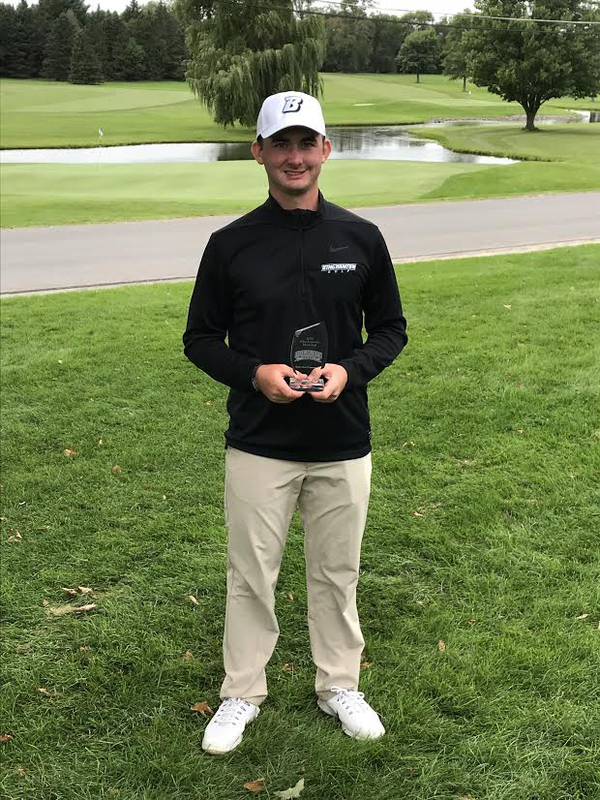 As for the opposing teams in the tournament, sophomore Brendan Cronin of Lafayette shot ten under par for a total score of 206, finishing first overall. Lafayette went on to place first at the end of the weekend, with a three-round, total team score of 867. This was 10 strokes better than the second place team, Drexel, who finished with a score of 877. Cornell (878), Seton Hall (879) and the Bearcats (882) rounded out the top five. The Bearcats collectively had 152 pars over three rounds, which was the seventh-highest out of 17 teams. The birdie total for the Bearcats was 41, placing them inside the top five. In addition, the Bearcats had two eagles, good enough for the third-highest number of the weekend as a team. Griffiths and Lane each shot 11 birdies, tying for the highest individual count for BU over the weekend. Next highest was sophomore Nacho Glagovsky with seven, followed by Ottman and junior Ryan Rodriguez, who both shot six birdies. Ottman and Glagovsky each had one eagle, splitting the team total after three rounds. Griffith’s and Lane’s 11 birdies were the sixth-highest individual total for the weekend, tying with a few other opposing players at that number. Lane shot 34 pars and was the leader in that category for the Bearcats, with Rodriguez finishing one shy of him with 33 pars over three rounds. Ottman shot 32 total pars, and Glagovsky finished with 27. Griffiths finished last out of all participating Bearcats with 26 pars, to round out the 152 total shot by the team. Lane’s 34 pars were tied for the tenth-highest this weekend, with Rodriguez coming just short of the top-10 with his total of 33. The fifth-place team finish is the Bearcats’ highest finish in nearly a year, when they finished third at the Matthews Auto Intercollegiate in October last year. The Bearcats will look to build off of this solid performance this weekend at the Cornell Fall Invitational, which is scheduled to start Saturday, Sept. 15 in Ithaca, New York.